Bear Hill Rehabilitation and Nursing Center has been a dedicated provider of health care services for more than three decades. Founded in 1983, Bear Hill quickly established a reputation for excellence in both quality of service to its residents and meticulous grooming of its expansive location in Stoneham, MA. What followed over the ensuing years could be described as a steadfast pursuit of the finest in long term care services, spanning all levels of the operation—from building maintenance to grounds-keeping to the small daily tasks performed by our staff. The achievement of that goal is what differentiates Bear Hill from the monotonous living conditions seen at some nursing homes. 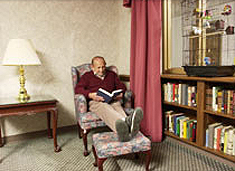 We strive to provide a fulfilling and genuinely satisfying experience each day, for every resident. In 1998, Bear Hill expanded its operations to include a Rehabilitation Wing, which since its inception has helped several thousand patients recuperate, recover and re-establish their roles in the community after hospitalization for injuries or surgery. Today, Bear Hill Rehabilitation and Nursing Center is proud to be considered one of the finest rehabilitation and long term care facilities north of Boston. As we have done since our beginning, we continue to welcome each day as an opportunity to continue or improve the quality of the life experiences of our rehab patients and residents. We know that “the little things matter.” Our staff takes pride in delivering excellence on a minute-by-minute basis each day, with the goal of making every rehab patient, and every long term resident, feel they are the most important person at Bear Hill.